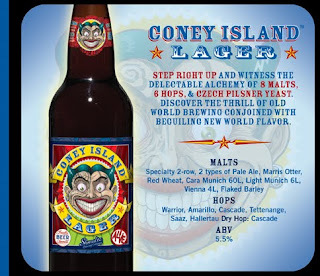 Hey Quickcrit gang, swooped some beers for a new Friday Night Beer Pairing, Coney Island Lager. I know absolutely nothing about this beer, picked it up cause I thought the label looked really cool. I think it's officially summer now in San Jose as it has stopped raining and is now really hot. I am excited for this, as I could use a change of pace. Lately I have been listening to a lot of blues, punk, and gritty rock in the crummy weather. I need some heat, mama's showin skin with the short hem, and some move your hips music. So to go along with my summertime enthusiasms I am pairing Coney Island with Kings Go Forth and their newest album "The Outsiders are Back" released in April of 2010. These guys are pretty solid, and I am having a real hard time believing they are from Wisconsin. I guess I shouldn't knock Milwaukee since I ain't never been, but when think Wisconsin I think Duane Kuiper and dairy farms, not congo drums and reggae soul. But they display a very talented mix of RnB, Funk, Latin Jazz, and Reggae. Remind me a lot of Third World see "1000 Songs", with maybe some Joe Bataan like on track "One Day", or possibly Earth, Wind and Fire on tracks like "Now We're Gone". Don't get it twisted now, I'm not sayin they are biting people's style, as they definitely have their own flavor and the whole album is very strong work. My favorite track is "Get a Feeling" as it reminds me of music in the park. Horns blastin off the buildings, harmonious vocals that make people step in line on time, and the breakdown bass and congo drums that crank it up a notch to make you sweat hard in the heat. Also, by the way, this Coney Island Lager is really good. I bet it would go perfect with a Nathan's hot dog, or with BBQ ribs at music in the park for that matter. Thumbs up To Kings go Forth and Coney Island beers! Glad you brought back the Friday Night Beer Pairing! I was just thinking about it last night as I tried to figure out what would pair well with the Ark. We might need to expand beyond just beer because let's be honest, some bands are more conducive to hard alcohol. I was thinking the same thing last night, I'm going to review Hola Ghost next but I need to pair it with something strong. We can keep the FNBP tag, but let it stand for Friday Night Booze Pairing. I look forward to the next Friday night beer pairing. I miss living vicariously through the blog. On it. I'll do this Friday.